Having now assembled the primary instruments of the greater divinations, you are ready to perform one such operation yourself. There are basically two varieties of these, one being the conjuration and communication with nonhuman entities, and the other dealing with the spirits or shades of the dead, necromancy so-called, or sometimes sciomancy. You will occasionally find that some witches tend to make the distinction between the two terms in that sciomancy, they claim, involving some relic of the defunct person summoned, an object link of some type, be it a lock of hair, bloodspot, or some personal belonging, attempts the evocation of the shade or ghost of the dead person, which is confined to visible appearance. Necromancy, on the other hand, they argue, implies the reanimation of a recently defunct corpse, as in the legendary operation performed by Thessalian Erichtho at the request of Sextus, son of Pompey. This distinction, however, is merely scholarly, and the majority of witches use the term "necromancy" to refer to the operation which the pedants label sciomancy, namely, the evocation, of the shades, such as was attempted by Eliphas Levi in the nineteenth century. The corpse-reanimation method is very rarely, if ever, attempted these days, for obvious reasons. Necromancy does not call for the use of your show stone, but rather a triangle of manifestation, so I shall leave that process till last, and deal with the conjuration of nonhuman entities first. The entity summoned for questioning par excellence is one that has been a favourite among witches from time immemorial, and is known by the name "Vassago." He is numbered among the seventy-two demonic intelligences in that medieval grimoire, the Lemegeton, or Lesser Key of Solomon; and Wierus, Cornelius Agrippa's pupil, also mentions him in his Pseudomonarchia Demonorum. But knowledge of his existence dates back long before this, even to before earliest Babylonian times. He was one of the Nephelim, and in Eastern fable, he is accounted one of the seventy-two Lords of the Djinn. Your experiment should be performed during clear weather, when the moon is two, four, six, eight, ten, twelve, or fourteen days old, and thereby, of course, always on the increase. So great is the power of Vassago, however (he is a "prince" in the hierarchy), that he is not bound by any sidereal or solar rules of time, and therefore may be summoned at any hour of the day or night. He is to be called only in matters of extreme perplexity, when all lesser methods of divination have availed you naught. Although he is "good by nature," it is extremely important to remember that he is one of the seventy-two from of old, a being formed out of primordial fire eons before man evolved into his present shape, of an intelligence at this present time far superior to that of most men alive, and in the humiliating position of being susceptible to conjuration by apelike clay-formed Homo sapiens, by means of a faculty as yet mostly underdeveloped within said simian creatures. So approach his conjuration with extreme respect at all times; it is no idle operation. Having selected your day of operation, you must choose a companion to act as a scribe or recorder of the visions. Lock yourselves in your secluded place of working, having gathered together your paraphernalia and such other close companions as are immediately concerned with the divination. Your Athame, cord, thurible, cup, workbook, square of Mercury, and pen and ink of art, a supply of Mercurial incense, and a box of incense consonant with Vassago's nature (see end of this chapter, "Herbs and Incenses"). All or any of these things may be held by your assistants throughout the operation. 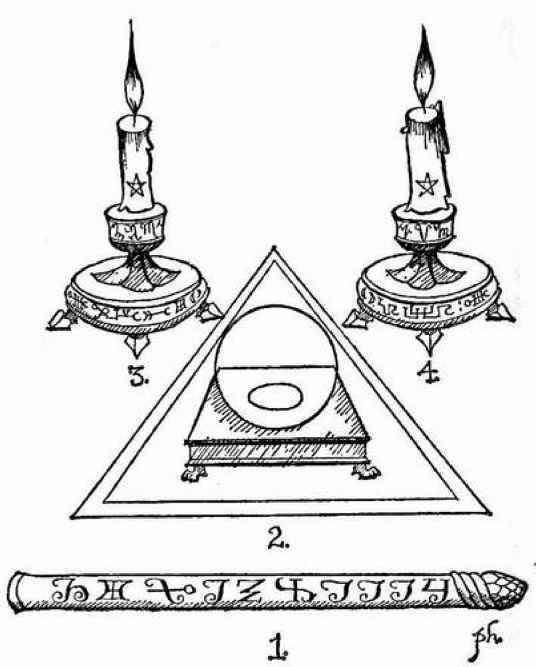 On the table itself should stand your show stone, or speculum, within the triangle, and to either side and about twelve inches behind it should stand two of your candlesticks containing exorcised white candles. The person who is to perform the ritual must hold the wand in his right hand; upon his breast (and indeed those of his assistants) should hang the pentacle of protection. When all is safely in position, kindle your Mercury incense and candles, and trace around your floor a triangle with your Athame. Then proceed to cast your circle and exorcise it with fire and water as usual. Having done this, you should next perform the square of Mercury ritual to attune yourself. Then replenish your thurible this time using "Vassago" incense. 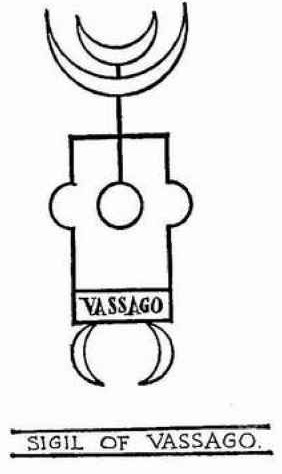 Now, take two of your clean sheets of paper, and on one draw the sigil of Vassago full size, as shown in the illustration, with your pen and ink of art. On the other also draw the sigil but this time small and in the top, right-hand corner. Next, on this last sheet, carefully write out the question you wish answered. On this piece you will record the nature of your visions. "Creature of paper, I name thee Vassago. Thou art Vassago." "Creature of paper, I name thee Vassago. Thout art Vassago." Then, again with the wand, draw three crosses in the air above the symbol, and seal with the words "So mote it be." Vouchsafe to descend from thy abode, bringing thy influence and presence into this glass, that we may behold thy glory and enjoy thy society and aid! to descend and appear to us within this glass speaking secrets of truth and understanding. Then return to the west of your altar table, facing east, and place the sigil in the triangle under the speculum or show stone on its stand. At this point you must seat yourself comfortably in front of the table, and holding your wand with both hands, gently and without strain fix your gaze on the surface of your speculum. At the same time with all the force of your imagination, visualize the same blue radiance playing around the speculum, and audibly repeat the question or nature of the divination addressed to Vassago, as previously set down on your paper. As you continue to gaze at the speculum, the surface will appear to fade away; in fact, your gaze will shift out of focus, and then spring back sharply in again. This effect will continue for a while due to your eye being foxed by the shifting perspectives in the glass. You may also find you are experiencing a curious constrictive feeling around your forehead and between your eyes. At this point, should you have performed the divination aright, you will then begin to notice that the speculum surface has begun to haze over with a blue-grey mist. This is the sign that the vision is opening, and it is at this stage that Vassago will begin to take over and show certain things to you. He may initiate the vision by revealing himself to you in human or therioform guise, or he may simply begin to show you the answer to your queries in uncomplicated symbolistic tableaux, rather like the diminutive images seen through the wrong end of a telescope or pair of binoculars. 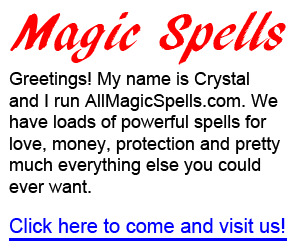 But one thing here is of paramount importance to beginner witches. Do not shift your attention from the speculum; try not to let your excitement at what is happening disrupt the delicate link between your everyday consciousness and deep mind. This is a very difficult instruction for the beginner, but it can effectively ruin the divination if not complied with. Sometimes you will find that pictures are building up at the side of your immediate gaze. Here you must resist the temptation to move your line of vision to catch a glimpse of them, but rather allow them to build and unfold themselves before you. Sometimes the visions may seem to make no sense to you at the time. Be that as it may, you must describe them out loud, and have the companion who is active as your scribe note them down with the pen of art on the paper on which the question is written. The visions are very fleeting and will vanish like dreams from your remembrance should you not take care to record them at once. When the stream of images seems to have finished, the glass will haze over for a last time and then return to its normal state. At that point, you must place more Vassago incense in the thurible and repeat the so-called licence to depart to Vassago, which breaks the spell and terminates the operation. This licence must never under any circumstances be omitted; to do so is to court magical disaster of the worst possible type, maybe even of the nature of that which befell the legendary Egyptian diviner Chiancungi in seventeenth-century England. He and his sister Napula had, as the result of a bet, endeavoured to conjure the spirit Bokim to visible appearance, unsuccessfully it seems, for no manifestations were forthcoming. After frequently repeating the formulae, Chiancungi and his sister grew impatient and, omitting the licence to depart, quit the circle without more ado. At which point, according to witnesses, they were "instantly seized and crushed to death by that infernal spirit, who happened not to be sufficiently constrained till that moment, to manifest himself to human eyes." Because there may be no visible manifestation of demonic activity does not mean necessarily that your spell has not worked. And even though Vassago be "good by nature," it pays not to take short cuts. To reiterate, in the summoning of intelligences, particularly those seventy-two formed of the primordial fire, maintain the strictest adherence to the principles of safe witchcraft. How to make solomon wand? How to summon prince vassago? Do you need a triangle to make vassago appear? What is a conjuration triangle? How to properly summon prince vassago? Can spirits really be conjured to visible appearance? 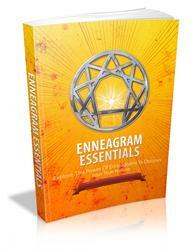 How to make a triangle of manifestation? How can vassago be conjured? How can i invoke vassago? How to use Vasago seal? Can prince VASSAGO bring vision and money? How to summon agares with sigil and personality? How to call the spirit vassago?